Gratutitous nail pics as I'm in love with my new super sparkly nail polish! Models Own Juicy Jules has been on my wishlist for ages but never got round to buying it myself, again thanks to grnnymlrs (well its my mums mum so its not melrose, but just just for continuity!) present choices its finally on my finger nails! Very happy! Wore my hair up again today as its really annoying my being as its so long at the moment. Tempted to get it cut blunt at the ends and get some extensions for some volume. I've had this middle parting ~boho~ ombre look for so long now its starting to drive me a little loopy. I wear my hair up quite alot at home in a topknot but rarely in outfit photos! This style is something I've recently started doing, really simple as is just a bit of a backcombed beehive around the crown, pinned back with a few clips and then the rest in a bun at the back! 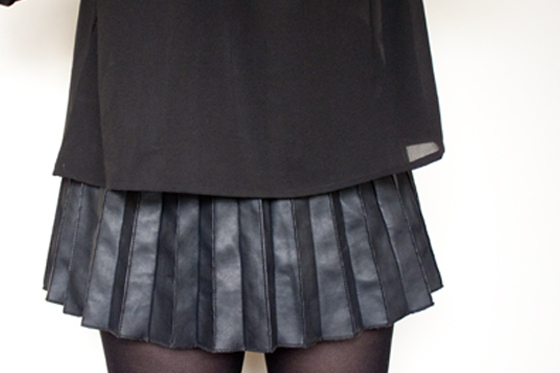 New peter pan top from the Primark sale and that Primark pleated pleather skirt! Picked up the last few in my local Primark for a few people in my local Primark that had gone to a measely £5. Absolute bargain if you can find them! I've worn mine countless times since I got it! I feel terrible as I'm always wearing the same sort of stuff at the moment! Sorry about that! Loving the middle parting ! The peter pan collar is super cute & I adore the rings. I like the full length shots! And your nails are gorgeous! your hair up really suits you! I love your hair tied back! Makes you look different! I love the nail polish as well I think I need to get on the old and already gone bandwagon of models own cause I've never even tried it :( your hairs look lovely too. Mines driving me insane cause it's too long hahah but i look like such a pea with it up! can't believe Primark are having a sale, lolz. definitely gonna look for that skirt though, it's lovely! Cute outfit, love the nails! Beautiful! Love the hair :) and the collar!!! oh i love the top! I'm searching for a collar like that for so long. I love your hair so much in this post! I really love your very unique style! The hair looks so great on you, this is definitely one of my favorite looks of you!! love your hair like this lily... I wear my bob a bit like this - a bit of backcombing or volume powder and then pull it from the side - have you ever considered trying the faux bob (fob!) - think it'd look lovely on you. lovely nails! infact after seeing your blog and your nails i asked for loads of varnish for christmas, haha..
i've had for blog for a year but starting it up properly now, it would be so great if you could check it out please?.. The up-do really suits you. I've been after some really glittery nail polish so I'm going to check out Models own now! I like your hair up like this. Looks pretty good :) Your nails are awesome. I am wearing silver glitter nails for over one week now because I just don't want to change them into another colour. Love, Lilly. wow, i love ur skirt and the top! Nice! I love your hair up! Love your hair up, very 60s! Umm you can definitely pick me up one of those skirts ;) I've been after one for ages but CANNOT find them!! Love your nails! I can never get mine to look like that with Juicy Jules, did you put loads of coats on or layer it on top of a silver? Great post! Love this look! Went to Primark today was a bit manic, I didn`t really see anything I fancied in the sales ended up buying full priced items. I love your hair like this so much! Lovely top you've found there too. plz take me shopping to primark with you, you always find the best stuff! i always go at the busiest time and give up before i find the gems/start kicking other customers. looking lovely as ever, love your hair and new full-length shots. Love the nail polish, it's stunning! Your hair really suits you up too, I'm sick of mine at the minute, when it's long it just gets in the way and gets tangled up and dipped in everything! Especially nail varnish! awwwh, you look lovely, i'm going to try and hunt down that skirt! really want it. i love your top it's so cute ! Love everything about this. I'd love to pull off messy hair like that. I'm loving the full length, wish I had some albas! You're hair looks lovely like this, going to try it on my own hair to make a change from top knots etc! I love this top, want to get myself to a primark sale - know I'll never find the skirt though, boooo. Need juicy jules! Your hair looks so nice here! I really love that coat! It damn well inspired me to get my own fur coat out of the wardrobe and wear it round town! Gotta love some fur in the winter!! I love your full body shots, amazing! This outfit and your hair is gorgeous. omg, i loved your nails. and your rings. i always love your rings, haha! i was looking for a top like this, i think it's so beautiful. and don't worry, i am always wearing the same sort of stuff too. 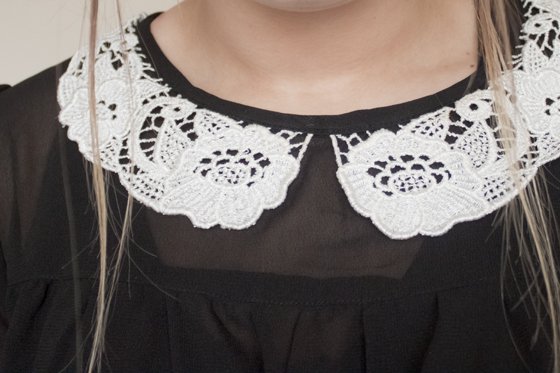 I love your peter pan collar top! and I have a sparkly nail glitter just like that and also in gold and I love them both so much I rarely use it for the fear of running out. Your hair looks lovely, I don't really put mine up that much, seems like hard work! Also loving the topshop boots! Don't cut your hair too short! Just get some rollers and a good comb if you want more volume, you will be so sad if you lop off your gorgeous locks! Gorgeous hair, you just cannot beat the beehive. Read my latest "when did being un-faithful become so fashionable?" Your hair looks so cute up! Plus, it really helps show off the collar and your shoulders! :) Great outfit as always. Pleasing the masses by showing your boots! haha. As others have said, I love you with the hair up. It makes you look so tall and really puts the focus on your beautiful face and outfit! Gorgeous look, love all of the different textures! Oh nothing, your just wearing another shirt that I want. I'm a sucker for Peter Pan collars.